Higher Education houses some of the most vile creatures in America, and the Associate Professor of Politics and Global Studies, George Ciccariello-Maher of Philadelphia’s Drexel University is no exception. 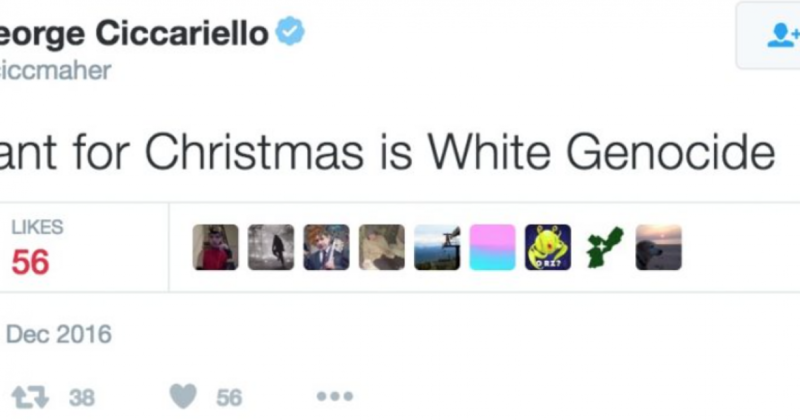 On Christmas Eve, Ciccariello-Maher tweeted, “All I Want for Christmas is White Genocide”. Before I get to Professor Ciccariello-Maher’s racist history, I’d like you to imagine what would happen if a white professor said this of blacks? Ciccariello-Maher’s anti-white tweets, however, did not start this weekend. Believe it or not, Ciccariello-Maher is a white man, as his name suggests. This white man is a self-proclaimed communist, who wishes for the abolition of the white race. His Twitter profile picture has him seated at a Starbucks (yes, he’s a commie!). Surprised? No. There are thousands of professors just like him, teaching your children. As a college student myself, I know that this is all too common. Far-Lefties control the public school system in America. Siding with anti-America, ergo anti-white has become the rocket to stardom in academic circles. Don’t think for one moment that this professor faces any potential for suspension or that he might lose his job. Know what universities have professors that advance a radical agenda. Check out the Professor Watchlist to find them. Equip yourself. If you are a college student, speak up when a professor is spewing off their radical nonsense. Read conservative news sources and pick up a book or two on Capitalism. Record these interactions with your professors and post them on social media. If they say something totally crazy a credible news source like Fox News is sure to pick it up. Send it to us, as we will cover it. Become a professor. It can be hard to get the job, but it’s not impossible. To take back our universities it starts with me and you.